Our Swiss ActiWa® Technology is based on the process of electrochemical activation of water. Drinking water with very little brine (usually NaCl) is passed through one of our ActiWa-generators and a highly effective, completely safe for humans, disinfectant is produced on site by means of a novel electrolysis cell. This electrochemically activated aqueous solution - called ActiWa® - contains a multitude of oxidizing free radicals and active substances. The active components are capable of destroying the microorganisms such as bacteria, viruses, spores and fungi within seconds. In practice applications, ActiWa® has proven itself very well and achieved excellent disinfection results. It is efficient in its effect and very cost-effective. Swiss ActiWa Technology is the new, resource-saving and economical solution for the disinfection process of the future. ActiWa® partially destroys membrane protections from bacteria and other eukaryotes. 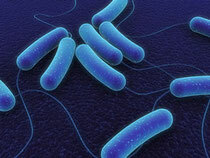 The internal pressure of microbial cells increases rapidly as a result of the increase in the fluid volume into the cells and breaks the cell walls due to the overpressure which results in lysis (evacuation of the cell content) leading to cell death and the elimination of microorganisms. This oxidative perforation of cell membranes in microorganisms is irreversible, since a cell is energetically unable to resist at the same time against various oxidation processes and therefore also no membrane repair mechanisms are available in time. These oxidative damages are therefore permanent, a major reason for the lack of resistance formation. The conductivity of drinking water is increased by addition of small NaCl brine. This water is electrolyzed by electrical current in a special electrolysis cell between the anode and the cathode. This means that some of the water molecules and salts are separated electrochemically into their individual parts and highly active radicals and active substances are formed in the aqueous solution. The diamond electrodes in the reactor cell have a high chemical and electrochemical stability and thus achieve a long service life. Moreover, the electrochemical window in the aqueous solution is much larger than in conventional platinum electrodes. See the next figure. 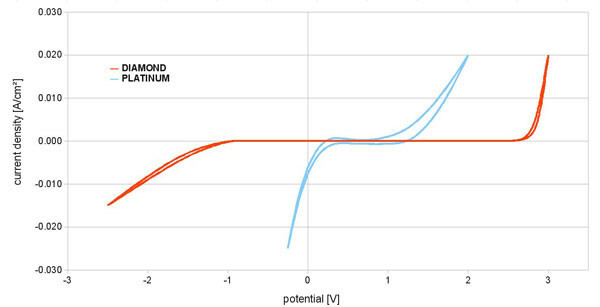 Figure 2 shows the large range of electron potentials of diamond electrodes compared to circuit electrodes. Therefore, the preparation of further radicals is possible. Owing to their very high oxygen overload, diamond electrodes are excellently suitable for producing strong oxidizing agents. Figure 3 shows the possibility of producing peroxodisulfate, peroxocarbonate, hydrogen and ozone.